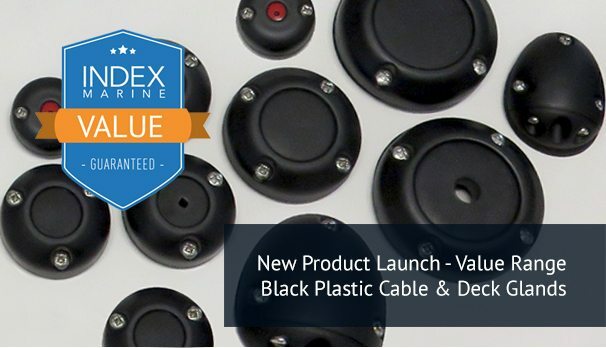 Index Marine announces the launch of their new Value Range black waterproof cable glands for marine and leisure applications. Moulded in durable black plastic, the glands have passed independent testing to verify IP68 rating and are ideal for routing electrical and data cables or connectors. The Value Range complements the current Premium Range of aesthetic finishes. The introduction of this range provides cable glands that are fit-for-purpose and manufactured to the same high standards with an attractive low price tag. The black range was originally developed to cater for the requirements of working boat designers and manufacturers. However, the initiative was taken to produce a full range suitable for the retail market so that all of our customer base can benefit from cost-effective manufacturing. Our main aim is to provide customers with a comprehensive choice, not only in the finish but also in the price range without comprising quality. The IP68 rated black cable glands are available in both in-line cable pass-through and right-angled side-entry pass-through models. These are perfect for applications where a waterproof seal is required for electrical cables, pipework or ducting through bulkheads, decks and panels. As well as marine applications, all Index Marine cable glands are ideal for use on inland boats, motorhomes (RVs), caravans and buildings where antennae, solar panels, and other electrical devices are mounted on the exterior where cabling needs to pass into the interior. Index Marine Black Glands can be purchased online or through our distribution network. For high volume requirements, contact Index Marine directly for pricing. RRP starts at £4.57* – £10.41* dependent on size.